What phenomenal weather we’ve had here in the PNW the past few weeks. We’ve been so busy using our new equipment, I haven’t had time to write about it. 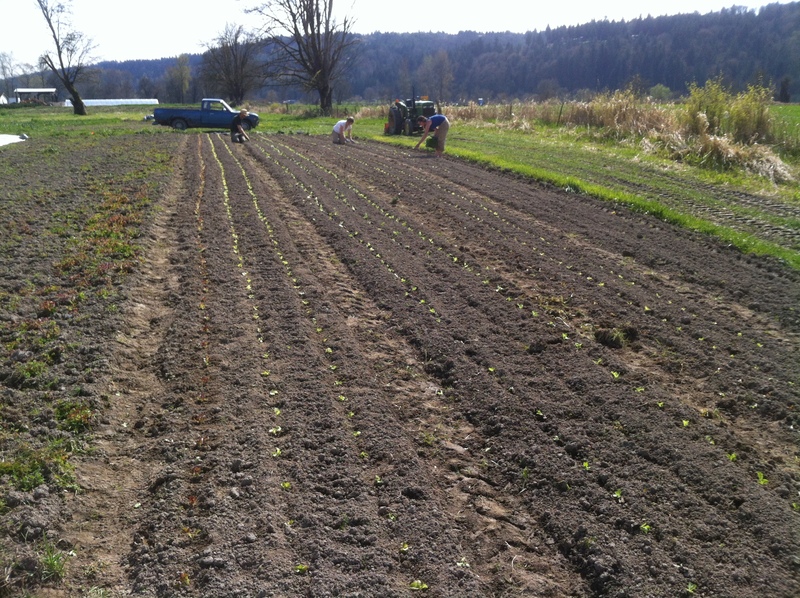 Since I last posted, we have been mowing, spading, disking, tilling, seeding, and transplanting up a storm. 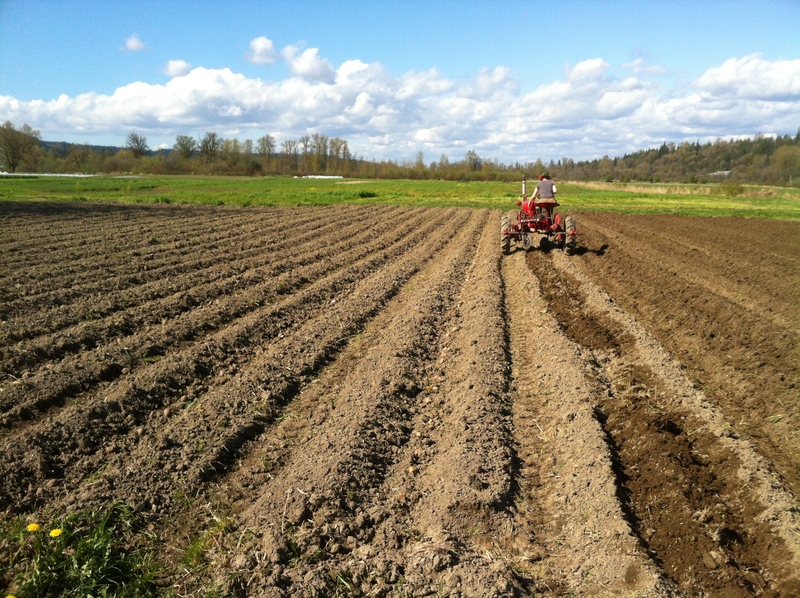 Today and yesterday we also planted about a third of an acre of potatoes. We made a furrow with hilling disks on the Cub and, after placing the seed pieces in the furrow, turned the disks around covered them up. 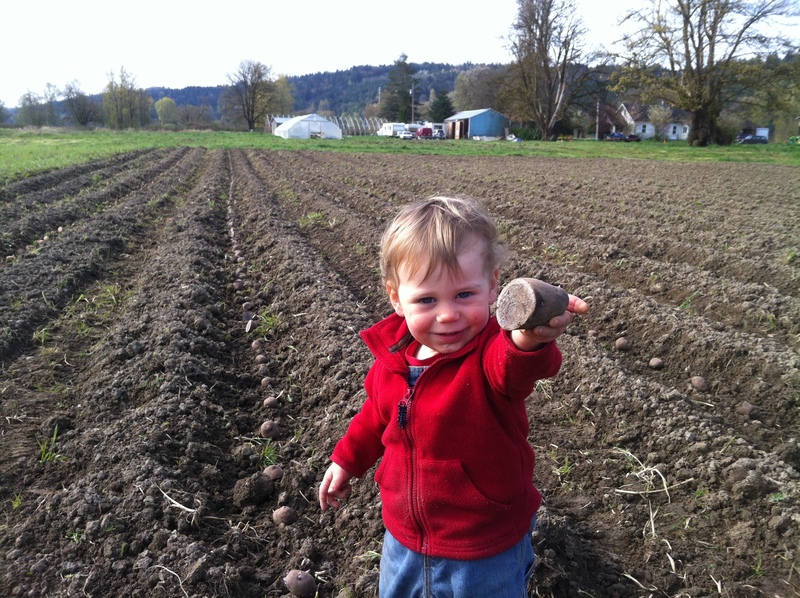 It was an amazingly fast way to plant potatoes. ...then you cover them like so. 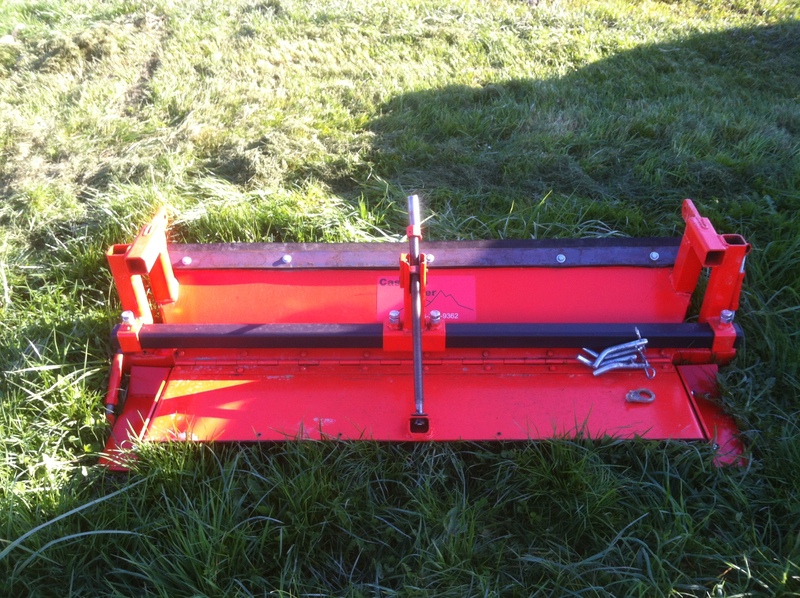 But the most exciting part about the past few weeks was experimenting with our modified tiller/bed-shaper. What we’ve created is basically what’s known as a pan-style bed shaper attached to the back of the tiller. What’s cool about it is that we can take it off and put it back on in about 5 minutes or less. 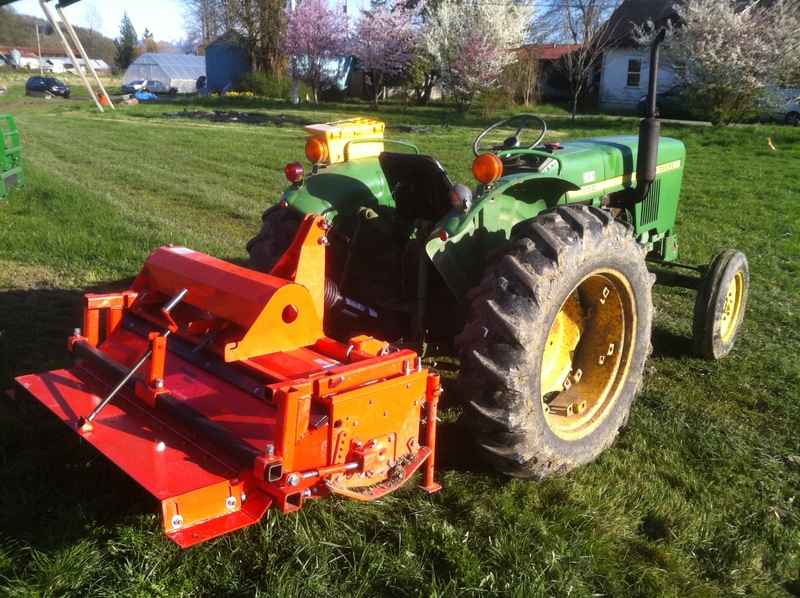 And, if we ever get a new tiller, we can easily take the attachment parts off and attach the bed-shaper to another tiller. Pretty nifty. The shaper starts out as wide as the tiller, 60 inches, and funnels the soil down to 48 inches. The rear pan is adjustable up and down using a jack-screw. The sides of the rear pan are also adjustable, so it can make a bed that is between 3 and 6 inches tall. Being able to adjust the rake of the rear shaper pan was especially useful early last week when we were tilling moist soil and wanted to till super shallowly but still needed downward pressure on the bed for the shaper to work. 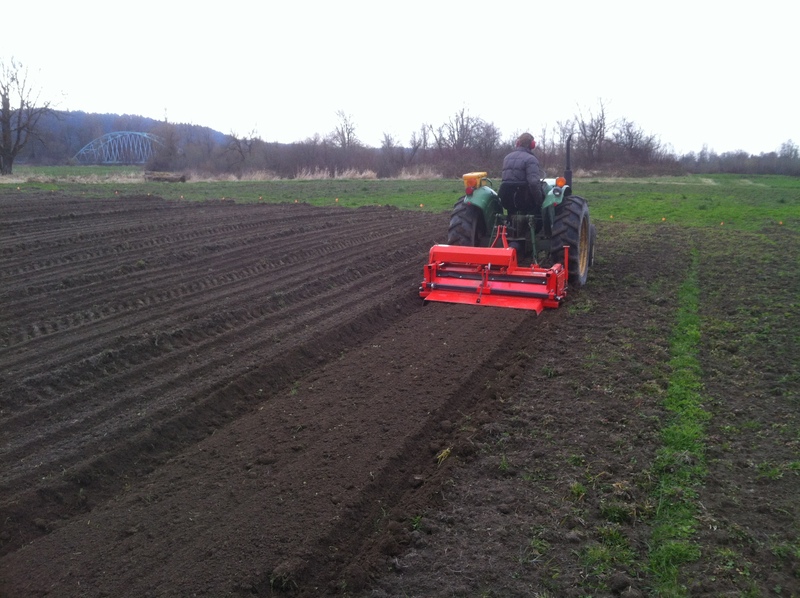 Using the shaper in damp soil. I’m especially pleased with the removable row markers. They’re nothing more than 3 bolts attached to the rear pan. But combined with fact that the shaper makes the walk path too, it saves us a pass with another tractor to mark beds for transplanting, and I feel that we are ending up with straighter rows. The next modification is going to be the addition of hilling disks in front of the tiller. We use a reverse spinning tiller which throws soil forward, irritatingly filling the just formed walk paths with a ridge of soil. Our hope is that disks will both block this soil and also channel more soil through the main channel enabling us to make taller beds. We hope to have version 3.0 of the bed shaper up and running by our next dry spell… Until then! First I would like to start by saying what a beautiful show of craftsmanship! I was hoping you may be able to email some additional pictures (if you have them) and possibly some plans? Please reply at your leisure with what additional information you have. Thanks a lot for your time! I agree – a photo of the reverse (from the front to back) of it when it’s off would be VERY helpful! We’re needing to have one of these manufactured as well – so thanks for documenting this! If you have more photos, please email them and thanks for sharing with everyone! Next time I have it off I’ll take some pictures…. Next time I have a few seconds, I’ll make another post with more pics, perhaps a video, and info on how you can contact Gary. He wants to build more of these, and it’d be easy to ship. Thanks for the comment. Hi there. I was wondering if Gary is still interested in building this type of bed shaper? I’ve got a 60″ tiller that is in need of a shaper since I too have to make several passes and I’m starting to use a G for cultivating next year. I live in Southern Maine (formerly from Enumclaw) and was wondering if he can ship them? I think Gary would have a pretty strong market for these – it would be just the right thing for us. Thanks for sharing. Super set up with the bed shaper. I have been studying this’d self and was trying to use my box blade as the starting point. However soils new to be dry and ground speed is hard to achieve and keep rows straight. Is the design for you tiller available for purchase? First. Apologies for my texting inabilities from my previous post. 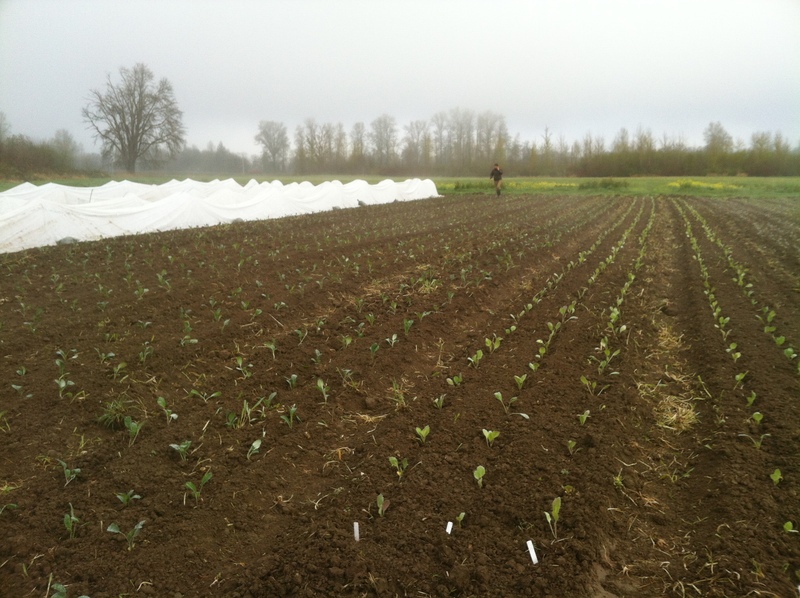 Do you information or pics of the planter you use for small seed crops?